A small gas fee to propagate withdrawals via Ethereum network. Traders operating via exchange trade against each other, so the broker is not interested in traders’ losses. Even when trading is performed against the “house”, deposits and withdrawals are handled by the blockchain’s smart contract, so the broker cannot refuse any withdrawals. Spectre.AI was announced in September 2017 with a private presale of its tokens performed in October-November and the public ICO process done in November-December same year. 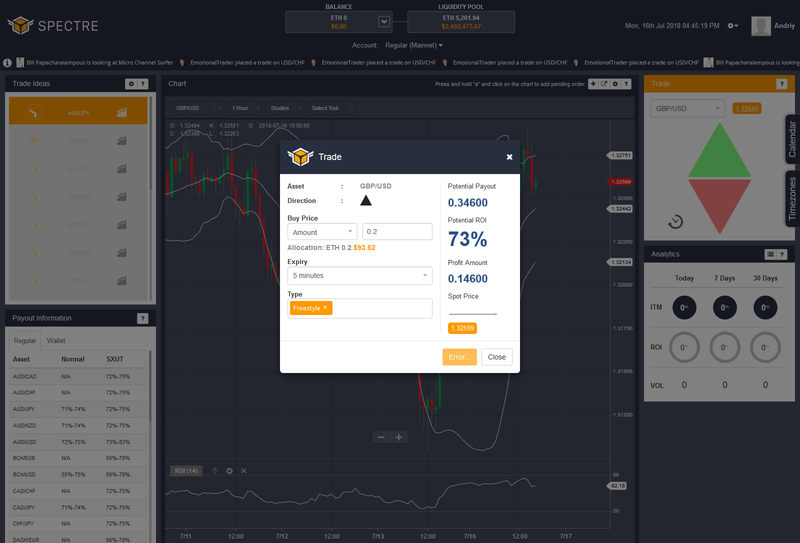 The alpha version of the trading platform has been also available since September 2017. In 2018, the platform has been launched into a normal operating mode with real accounts for binary option trading and multiple features. Currently, there are two types of Spectre.AI tokens available to investors – SXDT and SXUT. While SXDT tokens are not very interesting to common traders as they are simple dividend tokens, the SXUT can be useful to binary traders. SXUT are utility tokens; owning them provides benefits inside the trading platform. With SXUT, traders can get some viable perks, making it similar to traditional binary option bonuses or account tiers but provided in a much fairer fashion. Spectre.AI allows traders to work both with deposits and without deposits. When trading without deposits, the binary option contracts are bought directly from the trader’s Ethereum wallet. When trading with a deposit to the exchange, the funds are stored in a special escrow wallet operated by a smart contract – the exchange personnel cannot steal your funds, and you can withdraw them in an automatic manner. This completely eliminates the third-party risk. The minimum trade size is $10 (in ETH equivalent). The minimum deposit size when transferring funds into the exchange’s escrow wallet is 0.1 ETH. Note: operating with deposit offers higher binary option payout rates compared to trading directly from the wallet. The current trading platform looks good but not excellent. 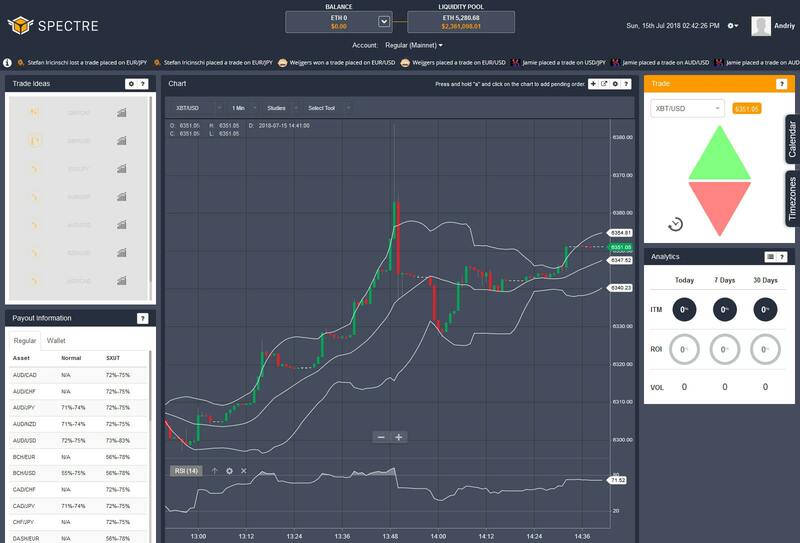 It has charts, trading panel, trading ideas panel, current news, news calendar, trading session indicator, basic portfolio analysis, list of trading instruments, list of your trades, a ticker line with recent trades (by people who decided to share their trades), and that is basically it. A lot of features are planned, including connectivity with MetaTrader 4 platform. 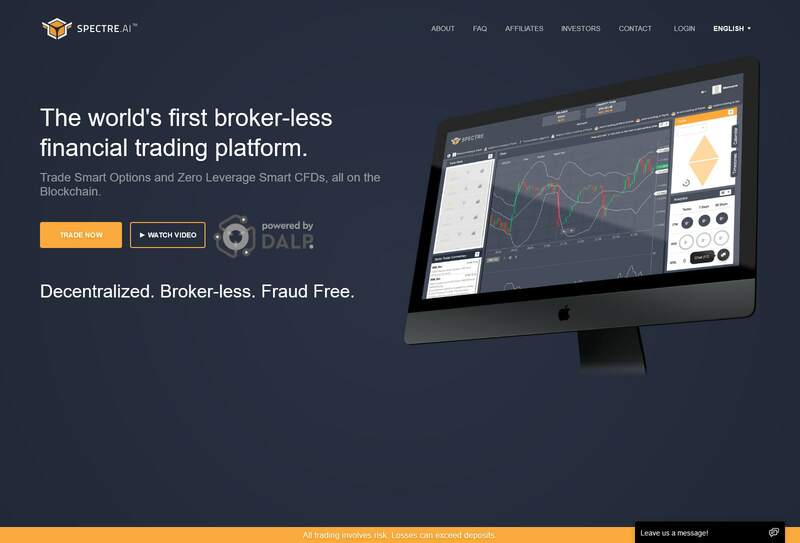 Overall, the platform is easy-to-use and does not look much different from what is staple with the traditional binary options brokers. Each panel has a small question icon to give you a quick explanation of its function. Spectre.AI has huge plans regarding the offered trading instruments and the range of markets for traders to deal in. However, currently, Spectre.AI offers only binary options (smart options) in 30 Forex pairs (including gold and silver), and 19 cryptocurrency pairs (Bitcoin, Ethereum, Bitcoin Cash, Litecoin, Dash, Monero, and Ripple). The current plans include the launch of the following trading assets before the end of 2018: 10 commodities, 500 cryptocurrencies, 1000+ stocks, 1000+ bonds, 10+ ETfs, 10+ indices. 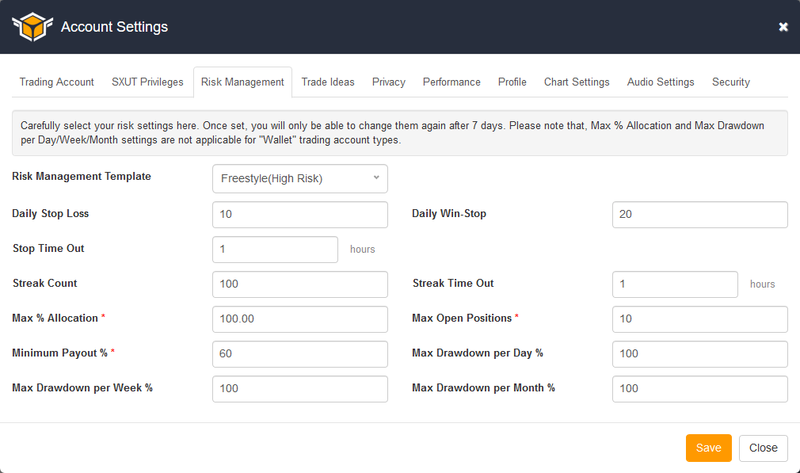 The option types included High/Low (traditional calls and puts), Barrier, Knock-in-Knock-out (KIKO), and Ladders. As you can see, the number of parameters to regulate your own risk profile is pretty big. You can set daily stop-loss, daily win-stop, stop-out time, streak count and streak timeout, maximum allocation per trade, maximum number of trades, minimum payout rate, and maximum drawdown per day/week/month. This is an invaluable tool against overtrading, revenge trading, and other behavior traits that can be very dangerous to binary option traders. You are not obliged to act on any of the generated trade ideas. You can decide on your own whether to trade it at all and, if so, how to trade it. The platform is clearly still under development with the plans for most capabilities launch spanning deep into 2019. Despite this, it has some limitations that are not connected with the platform being in development. The most notable restriction is availability in countries. Unfortunately, Spectre.AI is not available to the residents of the USA, Costa Rica, British Virgin Islands, Cayman Islands, Iran, Venezuela, the United Kingdom, Syria, Somalia, North Korea, and Yemen. Another important restriction is that no market is available for trading on weekends – even cryptocurrencies! The platform blames low liquidity on Saturday and Sunday. Spectre.AI is very different from your average run-of-the-mill-binary binary broker. It has its notable features and attractive advantages. It also lacks some of the deal-killer disadvantages of traditional brokers. Nevertheless, the platform is still pretty young, making it look rather immature compared to some decade-old brokers in the industry. The technology behind Spectre.AI is promising but requires a lot of improvements. If the team continues their hard work on the platform’s original objectives, this will undoubtedly make Spectre.AI one of the worthiest binary option outlets. Good trading platform. Ive had no problems in withdrawing funds since I started trading and seems to be the easiest platform to make a ton of money very quickly. The initial options were a little daunting at first as theres a lot of setting up to do, but once all done its quite nice and easy. The risk management how’s increased greatly my number of profitable days.